A beautiful sculpture containing thousands of poppies has been unveiled at the site of a major war memorial. The giant display named Poppies: Wave features a huge red flow of the ceramic flowers on stalks. 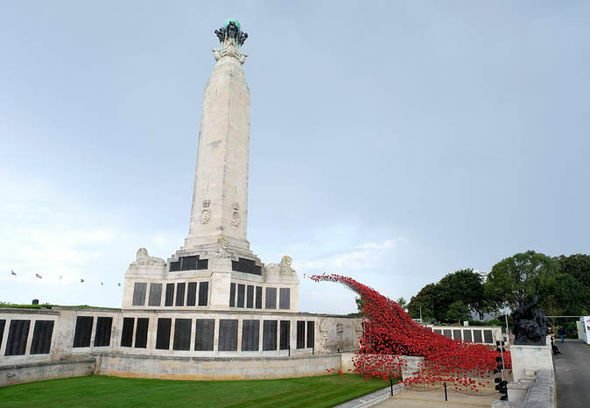 It took eight days to arrange the moving work at the Naval Memorial on Plymouth Hoe and was created by artist Paul Cummins and designer Tom Piper. The sculpture stemmed from the famous Tower of London poppy display of 2014 when where 888,246 poppies were displayed. They represented one for every British or Colonial life lost at the Front during the First World War. The touring display has been already exhibited in Southend-on-Sea, Cardiff, Hull and Derby. The Plymouth display, to mark the Devon city’s rich maritime heritage, will remain on the famous Hoe until Sunday, November 19. The Plymouth Naval Memorial commemorates almost 7,300 servicemen and women of the First World War who have no known grave but the sea. Glenn Hearnden, of the Commonwealth War Graves Commission, said: “This is a wonderful opportunity for the people of Plymouth and surrounding areas to be involved in the iconic Poppies: Wave. Wave is being brought to Plymouth as part of the UK-wide tour by 14-18 NOW: WW1 Centenary Art Commissions, to mark the centenary of the First World War.